Not many people know about portable monitors, and the people that do know about them often ask themselves why portable monitors are so expensive. In this post we’ll talk about portable monitor prices, why their expensive, and some cheap alternatives you can check out. Contrary to what you might think, there are some decent budget friendly portable monitors to play around with, without breaking the bank. So why are portable monitors so expensive? Portable monitors tend to be more expensive because not only do they have to be light and compact, but they’re only powered by one USB cable, usually USB-C. They have to be as energy efficient as possible. USB C port on Mac-Book. This cable has to provide the device with power while also transmitting images back and forward. In other words, the monitor has to collect enough electricity from this small cable to provide enough screen brightness while also dealing with software issues. Not to mention USB-C technology is still being developed, so this is a new industry. Another reason portable monitors are expensive is because it’s not the most popular device out there. When someone wants an extra screen, they’ll buy an external monitor, or use a tablet. It’s a very niche industry, and not one major companies are investing in, although ASUS has a few. What is a USB C Monitor? How can you use a monitor with a USB cable? How does it work? You probably only know about one type of USB, and chances are good you don’t know the name for it (Hint: It’s USB-A). It’s the most common type of USB and most USB disks and gadgets use it. Then there’s USB-C, a new technology pioneered by Apple, and being incorporated in most modern gadgets and devices (including Android Phones). 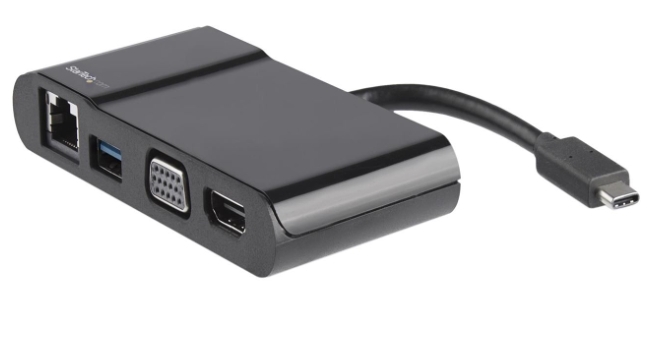 Typical external monitors come with a power cord and port for visuals, either HDMI, VGA, or DVI. You plug the power cord into a power outlet, and plug the cable responsible for images into your computer. It’s a solution that has been working fine for many years. Of course, this isn’t the most mobile solution. What you end up with is a stash of cables behind your desk, not an elegant look at all. Especially if you have multiple monitors, that’s two cables for each monitor, not including the wires for your other peripherals, a forever tangled mess. USB-C Technology: How Does it Work? Here at My Portable Office, we don’t like tangled messes. We like wireless, mobile, and light solutions. So let’s see how USB C monitors can benefit us. USB-C technology was designed to fix this issue. Without getting to specifics (and making your eyes glaze over) we’ll run through the benefits of the new USB tech. Basically it’s an all-in-one cable. Of course, to use the modes mentioned above, an adapter will be necessary, if your device doesn’t have the ports or hardware. For example, there are USB-C to HDMI adapters, audio jack adapters, and many others. If you have a laptop that only has USB-C ports you’ll need to buy an adapter if you want to to connect it to an external monitor that does not support USB C.
Now that you understand a bit about the USB-C hardware and technology, let’s get back to our USB monitors. These are monitors that can be powered and used entirely by one single USB cable. Do You Need a Portable Monitor? I can hear your spouse or girlfriend complaining about it now, “Why did you spend so much money on that?” so let’s save you an argument. While researching portable monitors and cringing at their prices, I found myself wondering if a portable monitor is necessary for my work. Chances are you’re struggling with the same decision too, so let’s work together. Are You a Programmer or Writer? Portable monitors can be fun to play around with, but unless you’re using it specifically for work, it might not be worth the cash you need to spend. So do you really need a portable monitor for your work? From what I have seen, the people who benefit most from portable monitors are software developers and writers. If you need one for work, I say take the plunge and buy it, because it will improve your productivity that’s for sure. P.S. If you work a lot on your laptop, chances are you’ll benefit from a adjustable laptop stand. Check out our recommended list here. On the other hand, if you just want a portable monitor for fun – something to watch movies on or play with – maybe it’s not the best idea to get one. Most of these monitors cost upwards of $200 and that’s quite a lot to drop on an extra screen, unless you’re going to make the most of it. Before you buy a portable monitor, there are a few things to keep in mind. For one, check to see if your laptop has a USB-C port. Most modern laptops and Chromebooks do. If you don’t have the right port you’ll need to buy a converter, usually USB-A to USB-C, neither of which are too expensive (but who wants more adapters!). Secondly, USB-C monitors tend to have more latency than regular monitors. In other words, there might noticeable lag between your computer and the monitor. This can be bothersome, especially for gamers. Overall, I wouldn’t recommend using a portable monitor for competitive video games. For office work, they’re more than suitable, and that’s the main reason I bought mine. But, unless your determined to get the absolute best product, there are some cheaper alternatives below. Although the best portable monitors are quite expensive, there are some cheap alternatives you can play around with, at least until you decide it’s a gadget you really need. We’ll run through some budget portable monitors and then talk about what I think is the best USB portable monitor. This is one of the cheapest portable monitors, and it’s a decent device too, at least for the price. Keep in mind, this particular monitor was mainly designed for mobile-gaming consoles such as Nintendo Switch, although it works on all devices. One cool feature about this monitor is it only uses a single USB-C cable, no need for a power cable. On this site, we hate cables, so the fact the gadget only needs one cable is great. What about the specs? You might think a cheap portable monitor such as this won’t have many impressive specs, but I was actually surprised. Overall, it’s a decent starter monitor. Priced at a bit over $100, this monitor is a decent choice. The cool thing about this monitor is you can choose between three models: Full HD, Full HD with USB-C, and Regular HD. The cheapest is Regular HD, although the resolution is lower (1366 x 768) but with the HD versions the resolution is a crisp 1920×1080. The Full HD versions are also slightly brighter. The monitor contains a gyroscope so the screen will automatically adjust when you rotate it, currently there are two modes: portrait and landscape. It also includes a simple built-in metal stand. Overall, it’s a decent monitor, and you can grab one without breaking the bank. I would recommend the higher resolution versions, although they’re more expensive, the extra brightness and resolution makes a big difference. The monitor below this section are all Zen Screens, and I thought I would take a moment to share some facts about this product line. For starters, most of the Zen Screens include a pen. This is not a touch pen. It’s a regular ball-point pen. Why do they include a pen? The main reason is because some of the Zen Screens contain a small hole in the corner of the device which you slide the pen into to create a quick and simple stand. It works. The secondary reason is because the majority of people who use these screens are businessmen, and businessmen always seem to have pens with them at all times. More pens never hurt anyone, anyways. Another thing you need to keep in mind is these monitors, unfortunately, are not touch screen. I found it a little strange that these monitors are pricey but no touch screen. There are so many touch screen tablets that are much cheaper than these monitors. So even though they look like tablets, and they come with a pen, they’re not touch screen. Keep your fingers clear from the screen! With that in mind, continue with our recommended picks. The Zen Screen product line are the best portable monitors out there. The most recent Zen Screens are quite expensive, although they’re the best portable monitors out there at the moment. The MB168B is one of the older ASUS models, released in 2013, and it’s a budget model. Let’s run through the specs. This product is a little old. Some customers have complained it doesn’t work well with Windows 10 and has driver issues with other operating systems too. If you want to get a Zen Screen, I would go for the newer models, which we’ll discuss next. 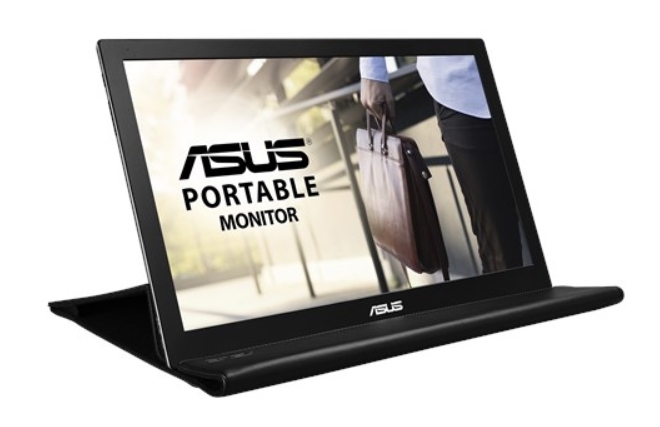 Two years later in 2015, ASUS released a new portable monitor with enhanced features and hardware. Though you might think this is a significant upgrade, honestly, they didn’t upgrade much. In fact, one could argue that this model is actually worse (although more expensive) than the previous model. My reason for this is because the MB169B is actually dimmer than the previous model. The main differences between this version and the old version are this one has a higher resolution (1920×1080) and an IPS Panel. Most customers report the image is crisp but a little dim. Nevertheless, it is a Zen Screen, which means it’s light and portable, and you can take easily slide it into a backpack. Let’s move on to the next product in the Zen Screen line. Once again, this is a newer model, released in 2017, and it’s one of the best portable monitors at the moment. The look is almost identical to the previous models, but with a couple new features. For instance, there’s a strange looking hole in one corner, which you place the Zen Pen into to create a mobile stand for the monitor. It’s one of those simple solutions that actually works. Of course, the box includes a smart adjustable case. Other features: Blue Light Filter and Flicker Free. The upside to this model is the crisp and bright (for portable monitor standards) image. Most customer reviews mention watching movies and working on the monitor is a breeze. It’s also very easy to set up with no drivers required, although there is a management software you should download. On the other hand, it’s obvious people didn’t like that case at all. Many reviews mention the case is too complicated to use, and unstable. Nevertheless, this is a modern portable monitor, and it’s very lightweight and portable, so you can slip it into a backpack or briefcase and take your office with you (which is what we aim to do!). Built In Battery. The M16AP includes a dedicated battery with up to four hours of battery life. When you plug the device into your computer you can select whether you want the monitor to use your computer’s power or it’s own power. The only downside is the battery is not that great. On the hand, it does have fast-charging capabilities. Works with smartphones. Now you can connect your phone to the monitor, creating an desktop-like experience straight from your phone. Throw in a Bluetooth keyboard and you basically have a laptop. Really cool. The downside? The price. It costs over $300 for one unit, and the price is likely much higher in certain countries. No touchscreen either. What is The Best Portable Monitor? If you made it this far, you’re probably wondering which, out of these five monitors, is the ultimate pick, the best portable monitor. The latest one, M16AP has the most features, but I don’t feel it’s the best monitor because it’s so expensive. In my opinion, the ASUS MB16AC is the best portable monitor out there, when considering the price and features. I also recently discovered this monitor does work with certain phones, specifically the S8 and S8 + although I’m sure most USB-C phones will work. Warning: Even though you technically can connect the monitor to your phone, it will drain your phone’s battery fast. It will probably only work for an hour or so, definitely not long enough to watch a full length movie. Keep in mind, there will be some customization required to get the monitor to work with certain phones, it’s not plug-and-play like the latest Zen Screen. You’ll also may need to download an app such as Display Link Presenter to get it working on certain phones. 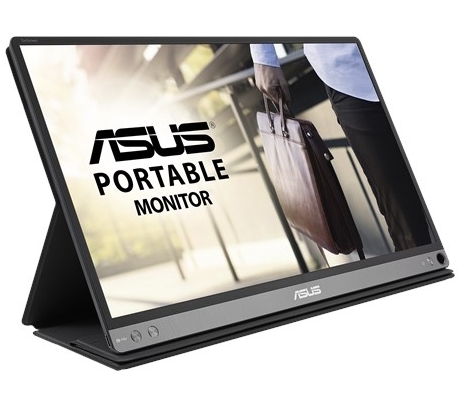 Overall though, if you have a laptop and you’re looking for the best portable monitor, I recommend the ASUS MB16AC because it’s great for the price. Of course if money is not an issue, the latest model, M16AP is the best choice. To wrap up this post, we hope the prices on portable monitors will come down in the future. Well now you know why are portable monitors so expensive, and some budget options. There are cheaper portable monitors that use HDMI cables, a better alternative for playing games. But the monitors we talked about here are the best for people who work from hotels and AirBnbs. Overall, I would recommend investing in a better monitor, at least a Zen Screen, because the cheap ones tend to break easily. My recommended Zen Screen is a good choice, although you might prefer other models. Remember, most of these products come with a warranty so if you run into issues you can request a refund or at least a replacement.